Norwalk Common Council member Chris Yerinides (D-District A), left, and Ordinance Committee Chairwoman Eloisa Melendez (D-District A), right, listen to Norwalk Police Chief Thomas Kulhawik, Wednesday in City Hall. 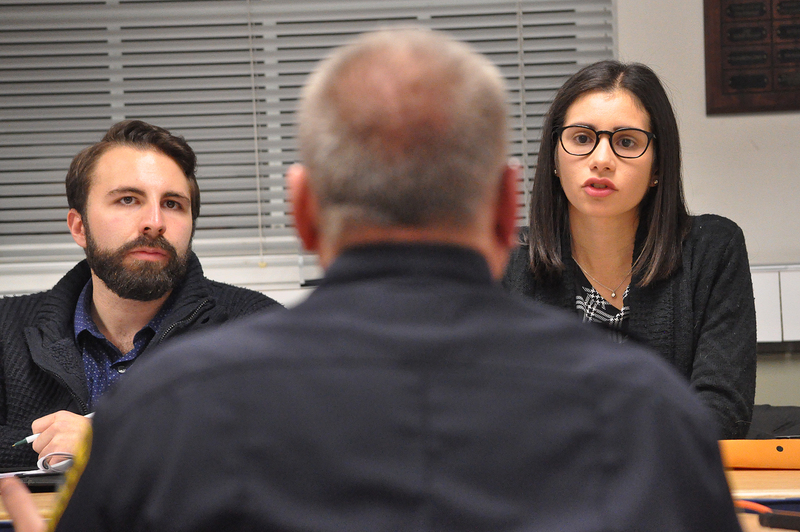 NORWALK, Conn. – Criticisms and suggestions mixed with resounding support Wednesday as Common Council members continued a long-standing effort to rework Norwalk’s noise ordinance. Village Creek residents lauded the changes drafted by a New Jersey consultant, and suggested adding a requirement for white noise devices on trucks; Norwalk Police Chief Thomas Kulhawik said enforcement would be much easier with the proposed clear guidelines, and SoNo business owners pleaded that they want to get along and be good citizens. During the lengthy meeting Eric Zwerling, president of The Noise Consultancy, sought to explain via telephone the changes he’d drafted for Norwalk’s noise ordinance after an April visit to hold meetings, take sound measurements and tour with City officials and interested residents Vernon Howard and Diane Lauricella. Zwerling returned in mid-July when the bars were in full swing and measured again. Zwerling said that he has written noise ordinances for communities all over the United States and the changes he has drafted for Norwalk are an amalgam of ordinances from many other jurisdictions, since Norwalk is unique with many issues. The changes need to be consistent with the Connecticut Department of Energy and Environmental Protection (DEEP) regulations, a “fairly stringent standard” with some problems, he said. He emphasized that the decisions are up to Norwalk and its residents, that he has made suggestions but has no agenda. The voluminous suggested changes include definitions of “continuous sound,” “extraneous sound,” “plainly audible” and “impulse sound.” Ambient noise would be revised to include cumulative noise; enforcement personnel would not have to stay at the alleged transgressor’s property line but could investigate on the complainant’s property; outdoor noise in a residential zone would be limited to 5 decibels during the day and 45 decibels at night, and 35 decibels would be allowed inside at night. The most fundamental problem, Zwerling said, is that the existing code doesn’t recognize that people live in all of Norwalk’s Zones, and its “greatest failing” is to apply the least restrictive standard. Addressing that was the most difficult challenge, he said. An exemption for construction noise is slated for removal. Paul Brashi of Village Creek said eliminating that exemption would be great, as sometimes companies have 25-35 vehicles running simultaneously on the other side of the marsh. Village Creek is in close proximity to industrial areas, with beeping, banging, and dumpsters clanging, and the community is “very happy with the changes proposed,” Teresa Peterson said. “The ambient noise requirement in there is definitely a good step but white noise backup beepers really help take the load off the community,” Peterson said. She added that construction companies learn the “sweet spot” provided when Norwalk Police change their shift at 6:30 a.m., and they can get away with more noise. Kulhawik said later in the meeting that the change of shift is an issue that needs to be considered. “Thank you for trying to tackle the issue of how to set reasonable noise limits in a way that is fair to everyone. We think there is much that is good in the draft ordinance but there’s two suggestions we have on how it should be improved,” Attorney Leonard Braman, representing Our House at 112 Washington St., said. Braman objected to the noise level set for inside neighboring residences and the proposal to limit noise after 10 p.m. on Thursdays. The draft ordinance correctly recognizes the Washington Street Design District as a unique destination and asset to the City, Braman said. Business owners find some of the proposed limits “somewhat workable” but object to the 35 decibel level limit inside a residence. “That’s lower than a whisper. So you are setting businesses, bars and restaurants, up to fail by setting a limit on sound that they can’t possibly comply with,” he said. Businesses are penalized for a lack of insulation in the old buildings they are renting space in, Braman added. He suggested a second-floor buffer zone of office or artist space. The 35-decibel limit would lead to confusion and more noise complaints, not less, Braman said. “We agree with a lot of the things you guys did,” Isaac Camaro, owner of Our House, said, but he believes 35 decibels is lower than what’s allowed in a library. Four restaurants have opened and closed in the last two years in SoNo, and, “We want to stay but we need to have help from you guys,” he said. Howard, a Washington Street resident who has complained about noise, disagreed. A noise study done on the previous occupant of the space now used by Our House yielded results at or below what is proposed by Zwerling – and that was on a Saturday night, he said. Democratic Town Committee Chairman Ed Camacho said he’s lived in SoNo for two months, in very close proximity to the railroad tracks, and while it was unlivable at first, the installation of soundproof windows inside the regular windows has made all the difference. He suggested incentives to encourage landlords to install them. “I think that would be fair because these landlords know that they are renting apartments to people who are going to have to coexist with businesses below that are often have music and things like that,” Camacho said. Windows would be fine but additional soundproofing would require careful attention to make sure that fire sprinklers are still adequate, Fire Marshall Broderick Sawyer said. Minority Leader Doug Hempstead (R-District D), Council President Tom Livingston (D-District E) and Council member Michael Corsello (D-At Large) all sought information on the budget to buy equipment and train officers. The equipment and three-day training class Zwerling has recommended wouldn’t be cost prohibitive, Kulhawik said. Supervisors would likely go out on enforcement and about 20 people would take Zwerling’s course. Zwerling said that as director of the Rutgers Noise Pollution Training Programs, he has trained 8,000 to 10,000 noise enforcement officers over the course of 29 years. It wouldn’t be hard to notice the non-Millenial out there with sound equipment, and the SoNo business security people are very observant, so “as a result, my guess, they may well have turned down levels to what they thought they could live with,” Zwerling said. That’s a good thing as “the levels are based upon what they were doing themselves,” he said. If the City wants to address pre-existing nonconforming uses, that could be written into the code, Zwerling said. He noted that he could research whether there are jurisdictions that have done that but, as an example, in New Jersey there’s a statewide flat-line limit of 65 decibels in the day and 50 at night. Long overdue but much needed. Congratulations to the Ordinance Committee. What needs to be added, however, is that most of the world considers excessive noise an important health issue. The proposal before the committee is step toward bringing Norwalk into compliance with the standards set by HUD, the World Health Organization, and developed countries throughout the world. There are various ways for businesses to limit noise that are relatively inexpensive. Several years ago, the ordinance committee discussed some of these measures and how noise in commercial/residential areas in NYC was reduced to international standards without causing financial hardship to businesses. One last point: In South Norwalk there has long been a strange type of mixed residential/industrial zoning that has made life very difficult for residents. The city needs to address that particular zoning configuration as soon as possible; with the understanding that it is dealing with a serious health issue. In Nowalk with an election coming up the Council’s attention is focused on “noise”. Not about punitive rising taxes, stagnant Grand list, falling property values, exodus of homeowners and all the “serious stuff”. No wonder our Council members are poorly regarded by our citizenry and the local business community . Too hard to tackle the serious issues ? No we are not happy at all, once again self appointed is in the right direction yet not close to where a solution is headed. Dumpsters are dumped all the time we hear all of them up on the hill on Quintard ave from all areas of the city, where was that mentioned? Its hard for the police dept to determine incident location ,no one has an exclusive on wanting abatement. This is where if Rilling had been an effective chief then Mayor shot spotter would of come in handy. Once he was asked about it Mayor Rilling out of touch with Technology and common sense said system was too expensive to purchase and install. This was when the shot spotter system is now rented or leased not purchased outright. We have here in Ct cities ad towns who use the system. This also adds a level of protection to our officers money cannot buy. They respond knowing what kid of weapon how many and intensity of a shooting before they head towards an incident. Does the system work on dumpsters and rock crushers ? Leave that to the reader for the moment. There are various ways for businesses to limit noise that are relatively inexpensive. your right Bruce but sometimes its not safe sometimes . MR Broderick should be thanked for his input he is on the money as he is every time. The owners of the Rhode Island nightclub that burned to the ground last week, killing 97 people, had purchased cheap, flammable foam nearly three years ago which — if it was installed on the walls and ceiling for soundproofing — would have violated state law.What is Sate Law Bruce? Help me out Mt Broderick we always count on you and you always deliver. Thank you again. Thanks to Vernon Howard its been years since the first article (NON) and still your working towards resolve , hang in there Norwalk is full of slow learners. budget to buy equipment and train officers add that to what the fire dept needs for natural gas detection units and take the money from the mall they both will be used there as well.Time to start planning. Trucks sitting waiting for the mall will be the issue where apartments ring the mall property. Why are the same people working on this noise issue , one would think a resolve after all these years would of been reached. Now what we have is the pile driving the thud then the ring was that addressed? Rock crushing is heard all day in South Norwalk an issue or not? Sorry I missed the meeting thank you Nancy I didn’t miss the antics. Please delete previous comment and this line. For some reason my copy and paste missed the first few words. Thanks. When we first moved to Washington Street five years ago we had no idea the amount of noise we would need to deal with. Yes, we expected some considering the area, but not 62+ (80+ at times) decibels being pumped into our bedroom from below and our furniture, walls and belongings vibrating from the low-frequency bass. How on earth Norwalk allowed this to begin with is beyond imagination. No wonder the previous owner was so inclined to accept our lower offer. If we had known it would be that bad, we would have noped out of there fast. environment free from excessive sound and vibration that may jeopardize their health or safety or welfare or degrade their quality of life. The current noise ordinance does not do that in the least for the residents that live above these establishments. 62 continuous decibels is ridiculously loud to try and sleep through especially with everything vibrating around you from low-frequency bass. From our experience, it’s pretty much impossible. There is good news though, It’s gotten better over the past year, but that’s only because the current tenant is adhering to more acceptable sound levels, but we’ve learned that can change at any moment. The noise ordinance committee needs to push these proposed changes forward so that landlords and owner/occupants of these units are no longer subjected to the whims of the businesses below from day to day. Also, I misspoke at the meeting and got some numbers mixed up. The noise study that was performed on 3/31/17 in our unit had meter readings ranging from 39 – 49 dB(A). We would find a max nighttime hours limit somewhere in the range of 42-45 to be more than acceptable to us. What exactly does the “ordinance committee” do for Norwalk? Does “enforcement” fall within their purview? “Noise” is a tricky issue for this city, that through their delusional planning and zoning encourages a “club nightlife” atmosphere on Washington Street while approving high density apartments on the same. Regardless of who they choose to protect, the businesses that don’t want rules or the folks who chose high density housing and expect a pastoral environment, the city will surely lose. We know the State DOT finds such regulations beneath them. Think the state contractors working the boondoggle Walk Bridge will give 2 cents? How about the Mall? Just wait for the cornucopia of sound coming from the intersection of West Ave. & I-95 come Christmas 2019. The mix I imagine will include the “ambient” sound of 200 honking horns, 100 f-bombs, 24 hrs of gridlock & Christmas Musak, 10 warbling carolers’, and the cries of “going out of business” by the 100’s from Wall St. to Ft. Point St. Surely this is a high priority committee, as the council chose to appoint it’s youngest and least experienced member to chair it. Now Eloisa is clearly considered a “comer” by the DTC, what with her VP appointment and ability to hold down district A. But before embarking on a tricky re-write of new “noise” ordinance rules, maybe the committee could focus on enforcement of existing ordinances? Like illegal apartments. Like invented contractor yards by new home-owners in AAA residential neighborhoods. How about POKO blight? Where is the report card? Hempstead’s chicken or egg comment was ridiculous. We can’t just say “welp, the businesses were there first!” Because where does that end if the residents were there first? Grasso wasn’t there before Village Creek became a community. It was Nash Engineering. So Grasso wasn’t there “forever and a day”. And who decides who was “there first”? The fact is these businesses CAN mitigate their noise through insulation, walls, site management, etc. In fact, there are people who specialize in acoustics (Jaffe Holden Acousics is right on Washington Street!) who can help figure that out for them. If a business wants to be loud, they should pay to mitigate it like they pay to mitigate dust and other pollutants. Cost of doing business, folks. The real answer to all these questions are that Norwalk’s resident need to vote for change ! @ Michael Foley, no words have ever been spoken more truer. VOTE RILLING AND THE ENTIRE CC OUT. Tom with no police report how does one figure out what happened here? Its 3 am and according to data how many calls to a closed establishment is still important. Back in the old days how many calls to a watering hole can effect its license. This shows a lot of work still has to be done but by whom? In Norwalk Criticisms and suggestions can be the same. The incentive to the building owners is the ordinance. We all spend money on our properties to comply with ordinances and regulations, from purchasing smoke detectors to paying for permits for alterations. Commenter Rick is correct. The police do ridicule callers who ask for noise enforcement. What’s more, they will refuse to even come out unless the caller identify the source of the noise for them first. Something that is not always possible. It’s nice that this noise ordinance is dealing with the noise for residents in areas adjacent to entertainment businesses and industrial uses. It utterly ignores the neighborhoods in which the businesses come to them, or the noise is a product of other activities. This does nothing for the three-season, daily assault by landscaping companies who bring noisy, polluting leaf-blowers and lawn-mowers. A city block’s worth of properties being maintained by these monsters on a weekly basis, can be exposed to up to 100dB almost continuously 12 hours a day, seven days a week. That doesn’t even include the bright lights who use leaf blowers to clean out the beds of their pick up trucks after doing contracting work all day. These things are health hazards from both the perspective of noise pollution and air pollution. That doesn’t cover the neighbors who choose amplified music for outside their homes in yard parties. I’m not talking about a loud radio. I’m talking about hiring bands, with microphones and block amplifiers, less than ten feet away from neighboring properties. There is nothing that prevents this from happening. NYC used to require a permit for this practice, easily obtainable at the local police station. Again, if you have a rotating cast of six neighbors who like to throw one of these parties at least once a month, you can spend entire weekends unable to hold a conversation in your own home. Crime in South Norwalk can’t be determined rising but calls for alarms along water st is rising so while cruiser teams are chasing noise with no bite the rest of the city is on their own for selective enforcement . While Common Council members continued a long-standing effort to rework Norwalk’s noise ordinance the city suffers from its effort. Pick up the pace the city is growing the Police Fire and EMS departments are not. Monday will be Woodward ave starting at 1 am with dumpster pick ups an issue not yet determined a problem. “the rest of the city is on it’s own for selective enforcement”. Almost true. Regardless of the selected enforcement, any time it takes for help to arrive, you are already dead. I was encouraged that I am not the only one with an issue with the noise issue on Washington St. Great article on ‘Nancy on Nowalk’. The noise level from 128 Washington St, Norwalk, CT 06854 is ridiculous and it is clear that the Salt Water Resturant owners have no incentive to insulate the noise. I have called several times about the noise to the Norwalk Police Department. The ‘music begins usually on a Friday or Saturday, sometimes midweek and is ‘loud’ enough to be annoying. The police officer does not take these complaint seriously in my opinion. They have said to me at least once that ‘this is Washington St’ as if the noise is ok if it is on Washington street. I thought about this and have thought about playing some annoying sounds from speakers from my apartment into the street. If it is acceptable for business to make noise, certainly it must be acceptable if a home owner plays music as well? Why is it the homeowner that is ‘expected’ to purchase soundproof windows, why not the business playing the music. I notice that the business purposely position the band and speakers next to the windows so that they can be heard from the street. it would not be so terrible if they stop playing at midnight, but they don’t stop playing until close to the 2 am curfew. Please let me know what is being done about the noise ordinances? for the record, i measure the noise level at 70.7db from inside my apartment with all my windows shut tight. we need to vote the politicians out. The owners of these properties must be penalized hard, so that they have skin in the game and have incentive to soundproof the leased properties. the business should also have skin in the game and be penalized for EACH noise violation. for the record, i measure the noise level at 70.7db on Jan 12 at 12:20AM from inside my apartment with all my windows shut tight. For the record, noise peaked at 74db at 12:22 AM Jan 12, 2019 from Saltwater Restaurant. It’s just about midnight right now, and I’m in bed listening to Poison by Bell Biv DeVoe. Thing is, it’s not playing in my apartment, but at Soho Bar across the street. That’s how loud it is. I can tell what song it is with my windows shut. Last night (among many other nights) Public Wine Bar’s DJ woke me up out of a dead sleep at 1:30am. I called them once to ask them to lower the music and the person who answered the phone screamed at me. I don’t even bother calling the cops anymore. They show up, but then the bars just do it all over again the next night. The people who own these bars think they are the saviors of Washington Street, keeping it alive with their bars and restaurants. Truth is, I think they’re terrible for Washington Street. Who is going to stick around here and make it a great place to live when they can’t even get a decent night’s sleep? The people who go to these places show up on weekend nights, get drunk, scream, make a mess and then go back to their quiet beds while we suffer. They’re not contributing to the betterment of this town, and for the owners to claim that is a complete joke. I’m not saying they need to turn the music off, I get that there are businesses on this street and they’re just trying to stay relevant, but there’s bar noise and then there’s constant public disturbance. I’m so endlessly frustrated by this.